I am an avid chocolate fan and whenever there is a privilege to eat or drink one, I would grab the opportunity right there and then! So when a friend told me about Choco-Late de Batirol at Baguio City, we went to the latter as soon as I land my feet in the city. Choco-Late de Batirol is located at Igorot Park, Camp John Hay, Baguio City. The place is so relaxing and one with the nature because of the garden that circles the restaurant. Wooden chairs, tables and plants make up the interior of Choco-Late de Batirol. As soon as the menu was handed to us, I know already what I will pick! Of course the traditional blend and suman but I also tried their champorado and tuyo. My friend tried arroz caldo and suman sa lihia. Champorado has the strong taste of cacao which is bitter. I added milk to sweeten it a bit. This is the first time I matched tuyo with champorado and I am excited if my palates would like it or not. The saltiness of the tuyo gave a twist to the bitter sweet champorado. The taste is weird for me but it is okay. Upon serving the aroma of the traditional blend made me smile. It has the strong smell of cacao. The bitterness of the cacao and the creamy peanut butter satisfied my palate. Suman on the otherhand has a bland taste. Nothing is special with it. It tastes like suman with muscovado. Lastly, the arroz caldo tastes good and is perfect during rainy season. While enjoying our chit chat, one of the friendly cat resident of the restaurant approach me, sit beside and later on sleep on my lap. I called this little guy Garfield. I want to bring him home but I can't. 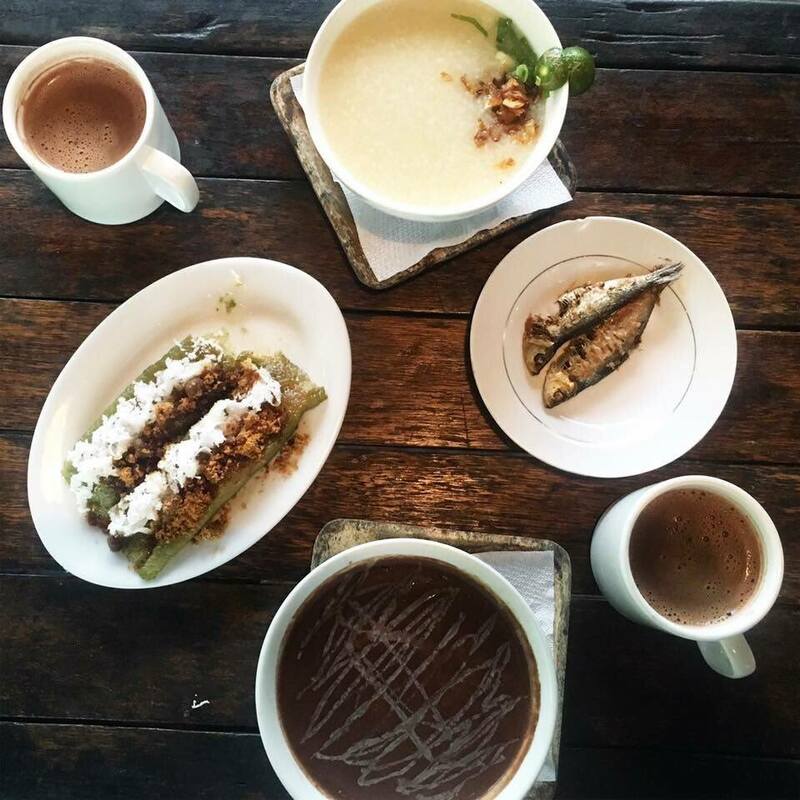 Choco-Late de Batirol did satisfy my palate with its traditional blend of Filipino dishes from champorado with tuyo to arroz caldo and of course traditional chocolate de batirol. The place is also perfect for quiet time and chit chat with family and friends. I was there during one of the many Baguio trips I took and found the chocolate drink, the so-called Chocolat de Batirol, entirely rich and satisfying. Thanks for sharing. Loved the pics. I went for a very short trip down memory lane. I'm excited to hang out here with my family on our next trip to Baguio! We'd be staying near Camp John Hay. We did not get to go to this place last time. We went to cafe by the Ruins last December. I want to try their suman and chocolate drink. :) Love the ambiance! What a wonderful place! So zen. You already know, I love all the food. I am particularly missing champorado with tuyo--two of my favorite things! Saving this for when I visit Baguio! Great combination of great food and location. I have never tried those foods combined but it looks delicious. this is really beautiful! i wish i could eat chocolate but this looks warm and cozy! I wish I had a place like that one in my city. It looks so amazing! I love that the cafe seems to be in the middle of a garden or a forest. It must really be cold there, you can see the mist in the pictures! The whole ambiance makes you enjoy the hot chocolate more. Bonus points for the adorable cat! What a great place to hang out at!! I would love to visit and relax there! We used to go to Baguio when I was a little. These are my comfort foods, perfect for the weather! Oh, this looks a lovely place. The food looks new to me but sounds like delicious! I love chocolate! The surroundings of this cafe is absolutely beautiful and looks like a place where you can relax and forget your worries while indulging in a tasteful treat. I would love to try all of these for myself. I love chocolate and this is a lovely little cafe. I love your kitty visitor!